p i r o u e t t e s i n t e a .
is sweet, sickly s w e e t .
w h o t a n s e a s i l y . Not many of us are inventors, none of us are creators. If there’s one thing we can haphazardly do, it’s to name things. We can, because every word we speak is a name for some morsel of the world in which we find ourselves. Haphazard, because we name things before we know what they are. That is, we have hardly an idea of what it is we are naming. While we recognize it when we see it, and while the word poverty has been thrown around with an assuring dose of mid-air hand-waving for centuries, it wasn’t until the early 1940’s when the most preliminary poverty threshold was established. And when it was, we realized that over half of the world was poor. Two thirds, to be more exact. And what does that mean? It means that poverty is real and objective. It is not a matter of comparison (Jack is poorer than Jill), in which case it would be mere inequality, and would give us a 50/50 split of the ‘rich’ versus ‘poor’. So good, we’ve made progress. We have become aware of a problem, and gave it the name poverty. Then, we defined the scope of the problem (though its definition remains malleable as the poverty line shifts from $1 per day to $1.90 per day from 1990 to 2015). But how do we address this problem? Free trade and development lead to a greater abundance of goods. This abundance of goods translates directly into wealth. Wealth is the opposite of poverty. So free trade and development cures poverty. In a coconut shell, this argues that the poor countries are poor by their own fault. That it has nothing to do with imperialism and exploitation, and that if they continued to export more sugar, coffee, and tobacco, and stopped protecting their local businesses they’d be rich. If you’ve read the previous post, you’d know free trade’s not a silver bullet. Even if you didn’t, common sense tells us that if all a country produced was a very narrow variety basic commodities, the lack of balance and diversity can seriously challenge sustainability, resulting in environmental degredation, food insecurity, loss of human capital, further eroding the country’s potential to quit the poverty cycle. As for the case for development, it goes something like this. If the poor countries developed, they would get rich, and the poor among them would be able to feed off the scraps that fell off the table of the elites, literally called the trickle-down effect. There are two things inherently wrong with this logic. First, development needs funding – if you don’t even have enough food to eat in order to stay alive, going to school to become an entrepreneur is probably pretty far down that priority list. Second, if the end goal really is to efficiently get resources into the hands of the poor, why sieve it through the hands of the wealthy first? But what do we care? All we care about is that Ghana and the Ivory Coast continues to satisfy our lust for chocolate. That if the label says ‘free trade’, I’m helping some cocoa farmer’s budding business. And once in a while when I sponsor a family to buy a goat, all of their problems will be solved. What good is a goat to me? Did that lemonade business I set up as a third-grader grant me economic independence? Then why are we fantasizing that these things will solve poverty? Don’t stop at the chocolate. Dig deeper. and don’t have enough to eat. To make the sablée dough, pulse all ingredients except the egg in a food processor until well blended. Add the egg and continue to pulse until the mixture comes together and forms a dough. Turn it onto a piece of plastic wrap, pat the dough into a 1-inch thick disc, and wrap it snugly with the film. Chill for 30 minutes until firm, but not hard. On a clean, floured surface, roll out the dough into a circle, 0.75 cm thickness, and fit it to a 9-inch fluted tart tin. Press in and trim the edges. Don’t worry if the dough breaks, this one’s quite forgiving – just patch it up with some scraps. Freeze until firm. Bake at 350 degrees F for 16-18 minutes, until the center is dry to the touch. If it puffs up a little, just gently pat it down with the back of a spatula. Cool completely. Place the chocolate in a large bowl. Heat the cream in a saucepan until frothy, then pour it over the chocolate. Gently whisk the mixture until smooth. Let cool to room temperature. 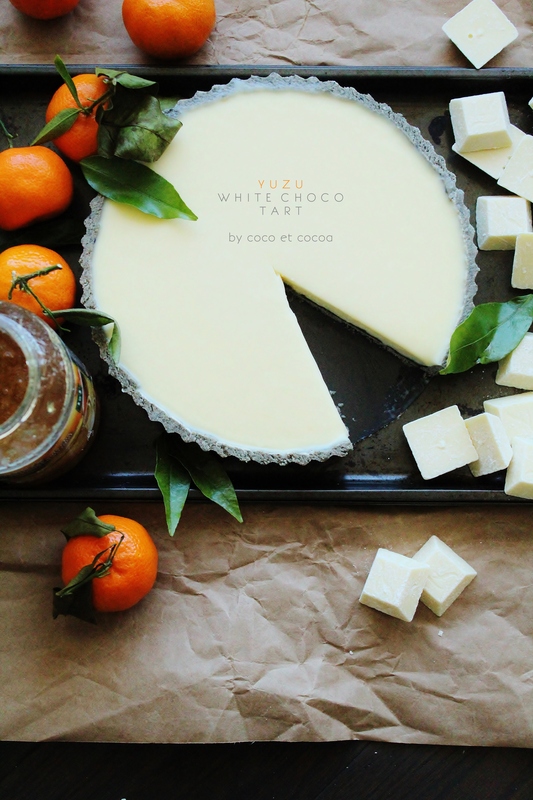 Spread the yuzu preserves in the cooled tart shell in an even layer. 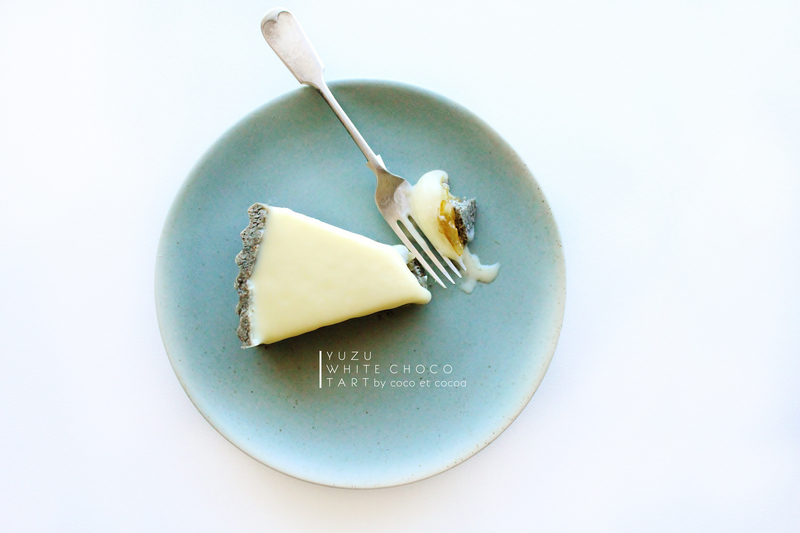 Carefully pour the ganache on top to not displace the yuzu layer. Chill in the freezer until set. Slice and serve – best with a piping hot cup of matcha.